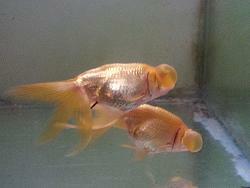 Goldfish are often described as greedy and always looking for food. There are two reasons for this behavior. Inside every small Goldfish there is a large Prussian carp wanting to get out, and Goldfish don’t have proper stomachs. I happened to glance at a friend’s Goldfish tank, as you do, and noticed all the fish breathing very heavily. This is a very well maintained tank with a few very healthy fish and a large filter. I also noticed the water was slightly cloudy. I asked the owner “What has changed recently?” Only the food she replied. This demonstrates that what we feed our Goldfish can affect the fish and their environment. Goldfish browse for food continuously because with only a rudimentary stomach, they can’t store a large meal and process it over several days. If they are given more food than they can eat, they will cram as much food into their digestive tract as they can, let it process through for a while before starting to feed again. If you look at the two images above, the one on the left shows one of my Water Bubble Eyes prior to feeding. As I am trying to get this fish and its mate up to breeding size as quickly as possible, I am feeding them all they can eat and more once a day. I first feed them a gel food that makes them quite plump. Then I toss in a net full of daphnia and mosquito wrigglers, far more than they can eat immediately. The image on the right shows them after gorging on daphnia for about 30 minutes. They have reached their capacity and have stopped eating for the moment. Notice that they are very plump, but they certainly don’t look like they will explode any time soon. After resting for about 5 minutes they will resume eating, but not at the same rate as when they started. They just nibble on a few daphnia and wait for a few minutes before eating some more. They will continue browsing like this until all the daphnia are gone. This will take several hours. 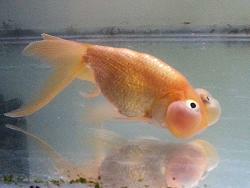 What this proves is you can’t over feed Goldfish. Using this technique I have been able to double the size of fish over a 6 month growing period. So if we want to feed our fish heavily to achieve a fast growth rate, apart from live food which will stay alive in the aquarium or pond until it is eaten, what foods are suitable? Most dry prepared foods I have used over the years tend to cause digestive problems in fancy Goldfish the more you feed them or, they quickly break down into inedible dust which then pollutes the water. Could a gel food be the answer? •	It wouldn’t quickly dissolve in the water and become an inedible powder that pollutes the water. I started feeding Repashy Soilent Green to all my fish in August last year after reading of the success other Goldfish keepers were having with it, and how a Plecostomus breeder found his shy retiring fish would become very active and bold as soon as the food hit the water. I have found the same behavior with my bristle nose catfish. •	It has a high green matter content which is important for juvenile fish and adults because green matter naturally forms a large part of any carp’s diet. •	The fish seem to process a large proportion of what they are fed, so the amount of waste produced appears to be less. •	I haven’t had a single swim bladder issue since feeding Repashy’s no matter how much I feed to my fish. •	It has to be mixed with water (3-1) and the mixture brought to the boil (30 seconds in a microwave oven). •	The initial smell produced before it gels. •	It is fairly expensive. Am I sold on this food? Absolutely. It has solved the most important problems I have had feeding Goldfish heavily for growth; water pollution and swim bladder disorders.